Howdy! Happy TGIFriday to you. Is it me, or are the weeks just flying by? I think it's because school is starting next week. And, I for one, am not ready for the frantic school day morning routine. I've grown accustomed to easing into the day with a couple cups of coffee before all my little people arise. On a positive note, I will have a few hours a day to myself. And in that time, I hope to get some decorating done in the dining room. window treatments!! This is my top priority in the entire house. I'll be working on them soon. Well, not actually "working" on them, but choosing the materials and having someone else work on them :) Stay tuned. eventually, (when I find something for a steal! 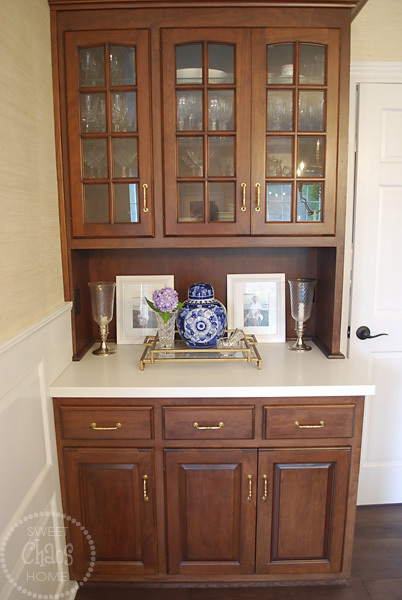 ), I'd like to replace my current hutch with a larger, painted vintage piece. I've got an idea in my head of what I want. Just need to find it. My goal is to have the window treatments and slipcovers completed by Thanksgiving. Just in time to spill gravy on them. If you missed them, you can check out the other rooms on my house tour here and here. it's come a long way! such a classy space! wow! what a transformation. cant wait to see how you improve upon how beautiful it is now. 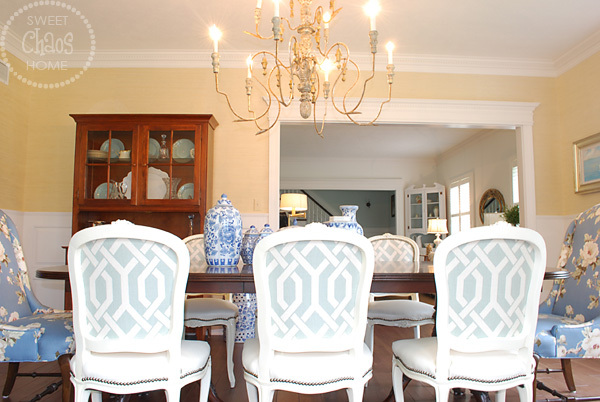 What a gorgeous dining room set you have - those chairs are amazing!!! Wow - you've brought new life into this space, Carolyn! 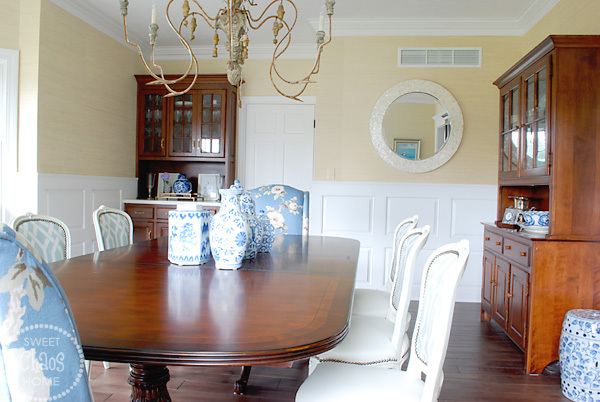 I love your changes - such a pretty dining room! What a beautiful room! I love the soft colors you chose. Lovely! Great transformation, what is your wall colour? 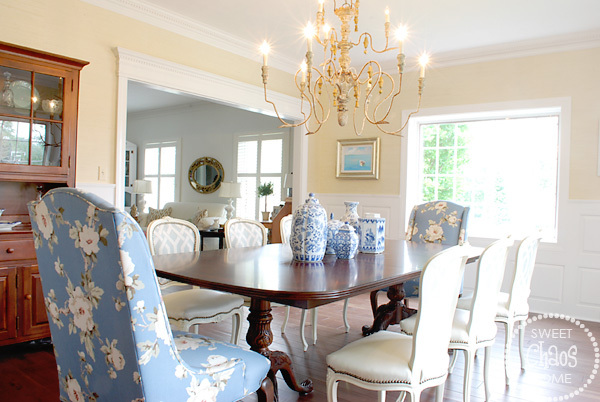 Carolyn, I love your dining room and the beautiful chairs are still my favorite. Visiting from Eclectically Vintage. Your dining room looks amazing! 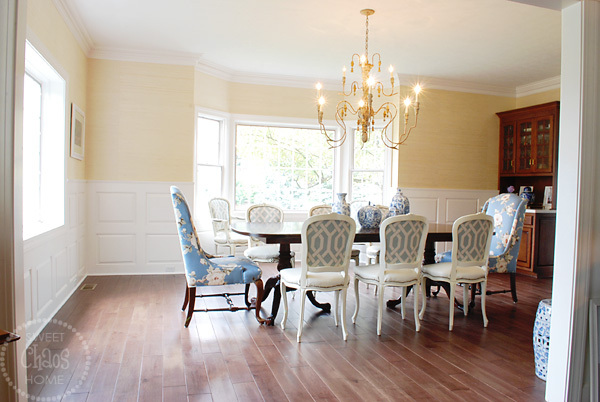 Carolyn your dining room is beautiful! 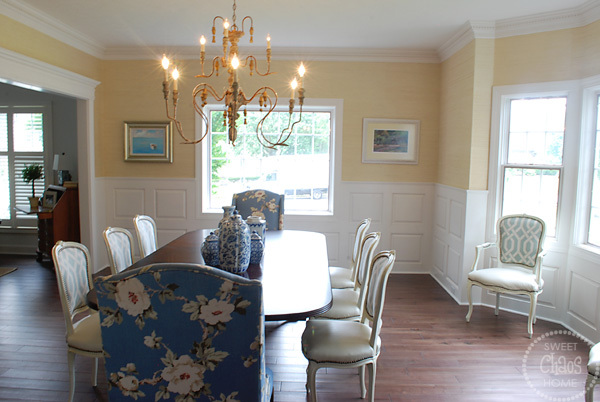 I love your chandy and end chairs. So so beautiful! I just love it!